Bengaluru: “Today, we have 598 students graduating – 20 from the Fellow Programme in Management (FPM), 18 from the Post Graduate Programme in Public Policy and Management (PGPPM), 75 from the Post Graduate Programme in Enterprise Management (PGPEM), 4 from the Post Graduate Programme in Software Enterprise Management (PGSEM), 70 from the one-year full-time Executive Post Graduate Programme in Management (EPGP) and 411 from the two-year full-time Post Graduate Programme in Management (PGP),” announced Professor G. Raghuram, Director, IIMB, at the institute’s grand 42nd Annual Convocation ceremony, held on March 20, 2017. The students graduated from the prestigious institution this year in the presence of chief guest Shri Uday Kotak, Executive Vice Chairman and Managing Director, Kotak Bank Limited, Kiran Mazumdar-Shaw, Chairperson, Board of Governors, IIMB, Professor G. Raghuram, Director, IIMB, and members of the faculty. The graduates were cheered by their proud families too, many of whom had made the trip to Bengaluru to capture the joyous moment forever. While sharing a selection of the successes and achievements of students and faculty of IIMB during the past year, Prof. Raghuram said, “Two of our faculty have been awarded as distinguished alumnus/alumna from their own schools as well. Our faculty are not just world-class academicians and researchers, they also excel in pursuing their interests and passions. We are delighted by their success. I take this occasion to acknowledge their outstanding contributions.” He highlighted the contributions made by IIMB faculty in publishing in A category journals and said that it was a matter of great pride and visibility for the institution. Among the graduating students this year, eight have been awarded gold medals. In PGP (Batch 2015-17), Udit Jalan, Dharmendra Hiranandani and Vaibhav Gupta received the gold medals for first rank, second rank and best all round performance, respectively. In PGPPM (Batch 2016-17), Pranav Kumar Mallick has won the gold medal for best academic performance. From PGPEM (Batch 2015-17), the gold medal for first rank and for best all round performance went to Shishank Gupta and Suresh Ganesan, respectively. In EPGP (2016-17), Nikhil Goyal has won the gold medal for first rank, while Kushal Nitin Dalal has won it for best all round performance. 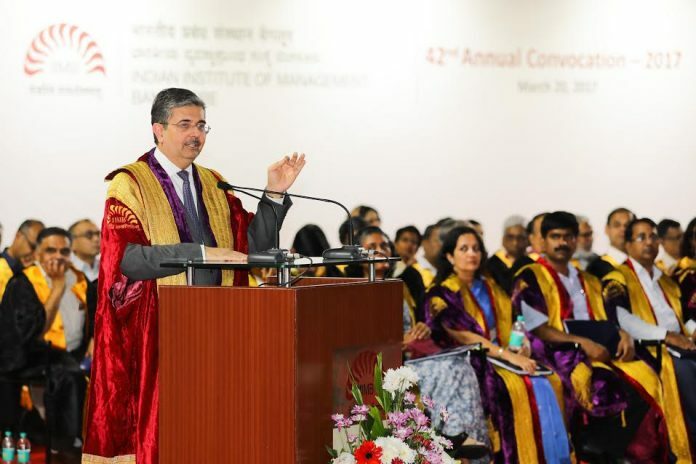 In his inspiring address, Uday Kotak, Executive Vice-Chairman & Managing Director, Kotak Mahindra Bank Limited, who was the chief guest at IIMB’s 42nd annual convocation, described IIMB as IIM Best, to loud applause. He shared with the management graduates a few of his life experiences and career journey. Dr. Kiran Mazumdar-Shaw, Chairperson, Board of Governors, IIMB, in her address, highlighted the institute’s milestones during the academic year 2016-17, the global rankings IIMB achieved, the important partnerships it entered into, IIM Bangalore being the convener school of the Common Admission Test (CAT) 2016, IIM Bangalore mentoring the new IIM at Visakhapatnam, the surge in demand for case studies developed by IIM Bangalore’s faculty which are distributed through Harvard Business Publishing, an affiliate of Harvard Business School, IIMB’s increased focus on Massive Open Online Courses (MOOCs) to provide access to a wide range of quality courses through blended learning programs for people who cannot afford regular management programs, IIMB’s initiatives in enabling a ‘start-up culture’ in the country and making ‘entrepreneurship’ an integral part of the school’s academic agenda, etc. She had a special word of appreciation for IIMB’s incubation centre, the N.S. Raghavan Centre for Entrepreneurial Learning (NSRCEL), which has consistently played a key role in seeding, nurturing and promoting entrepreneurship with an emphasis on early-stage start-ups. “As women remain highly underrepresented within the entrepreneur ecosystem, IIMB’s NSRCEL & Goldman Sachs have joined hands to launch the ‘Women Startup Programme’, the first blended-learning customized programme involving a MOOC and classroom training, as well as business incubation, to support the next generation of women entrepreneurs. The programme, which was offered at no cost, encourages and supports women to start their own businesses through a customized, three-phase model which incorporates online and classroom training as well as business incubation. The coursework is designed to teach both entrepreneurial and managerial skills, provide mentoring and networking opportunities, and access to capital to help empower women navigate their early ventures as well as equip them with tools to strategize and grow their businesses. I am proud to share with you that 15 women with great business ideas are now being incubated at NSRCEL for 12 months”. She made a special mention of another initiative of IIMB’s NSRCEL. “The Michael & Susan Dell Foundation has supported NSRCEL to set up a start-up incubator, with the objective of nurturing early stage non-profit organizations. This non-profit incubator will select and nurture at least five early-stage organizations over the next two years, helping them become world-class non-profits that deliver disproportionate impact and become magnets for talent and funding. This initiative aspires to create a proven template for non-profit incubation in India, developing a playbook for nurturing and scaling early-stage organizations. Such an approach can be replicated at other academic institutions and incubation hubs across the country”, she pointed out. She also mentioned that NSRCEL has been selected by NITI Aayog to receive INR 10 crore as scale-up support over the next two years, which will enable the centre to upgrade and expand its infrastructure and thereby its services to entrepreneurs. Welcoming the new IIMB Director, she said that it was a privilege to have a person of his stature and experience at the helm of this institute. While acknowledging the immense contribution made by Professor Raghavan Srinivasan in his role as Director Incharge, over the past one year, she said that Prof. Srinivasan has enabled a seamless transition from the previous Director Prof. Sushil Vachani to Prof. G. Raghuram. Lauding IIMB’s alumni she said, “IIMB’s alumni continue to do the school proud with their achievements and their connect with the school. I take this occasion to put on record that the alumni from the Batch of 1991 raised over INR 2 crore for Ganga Trust that works with survivors of spinal cord injuries. The PGP Class of 1996 also made a substantial contribution to the school”, she added.